DIGGERS Rest’s iconic Houdini model aircraft may have to wait until 2019 to find itself a permanent home in the town. Originally funded by the Diggers Rest Lions Club, the plane was built by volunteer artist Ian Satur for the 2010 commemoration of 100 years since Harry Houdini flew into Diggers Rest. Most recently the 3x3m plane has been housed at the Moorabbin Air Museum, but at the request of the Melton Model Aircraft Association, the plane was returned. The association had asked Melton Council to permanently house it at one of its facilities, namely the Melton Library and Learning Hub. That request was squashed when library staff raised concerns about potential vandalism and difficulty in cleaning the plane. Council officers instead suggested it would be more appropriate for the plane to be housed in Diggers Rest. But until a community centre is built as part of the town’s development, proposed for 2018/19, there is no suitable facility to house the plane in the town. Council officers claim until then there could be potential temporary homes found in Melton or Caroline Springs, but have asked for more time to find the right location. Melton councillors agreed to ensure housing of the plane is taken into consideration when designing the future Diggers Community Centre. Let's hope they can find a place to land Houdini's plane. It would be a shame to see this vanish as did Houdini's original Voisin! By the way, the Ian Satur model is not to be confused with another working replica made by Gary Sunderland. The Sunderland plane failed to fly at the Centenary celebrations, but it later did take flight at the Twin Cities Model Aero Club in May 2010. I don't know if the Sunderland model is displayed anywhere. 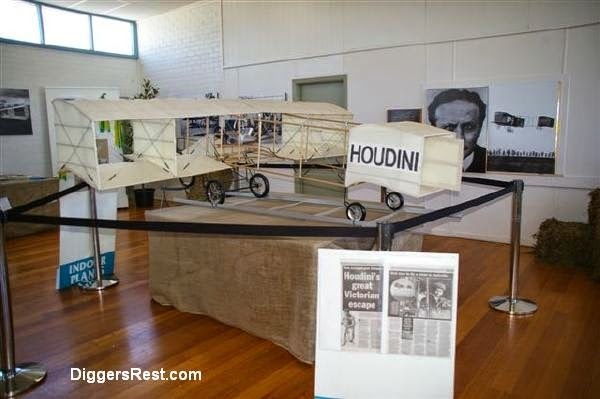 There are more articles about Houdini's flight and background to the model biplane on Diggers Rest Talk (the local online newspaper for Diggers Rest). We are keeping a close eye on the various activities and would like to hear from people who may help us complete the story of Australia's first power controlled flight. Thanks for the comment and the link, Rob. I will keep an eye on that page for updates. The Gary Sunderland model is currently in storage and will in time be displayed in Diggers Rest. The model was donated to the Community of Diggers Rest. Yay! Thank you, David. I didn't know about Houdini's Café e Cucina. I will have to do a post about it. May I use the photo? I'll provide links back.